Link your SuperDentists.com profile page to your own website or blog with a personalized complimentary badge. 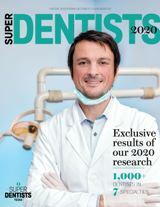 Super Dentists identifies top dentists as selected by their peers and the independent research of MSP Communications. Super Dentists is published online and also in print as a special advertising section in leading newspapers and city and regional magazines.